Saturday-Wednesday 8am-7pm; Thursday-Friday 8am-9pm; public holidays 9am-5pm. Forget your Edison lighting and Scando-inspired fit outs – the hottest eatery in this part of town is the now-legendary Oasis Bakery and supermarket, housed in a huge warehouse in a semi-industrial part of North Road. The Lebanese supermarket is home to every spice you've heard of and many you probably haven't. Initially, it was a small bakery, but their incredible food (at equally incredible prices) gained a cult following and owners Emad and Marwa Makool expanded the space five years ago. 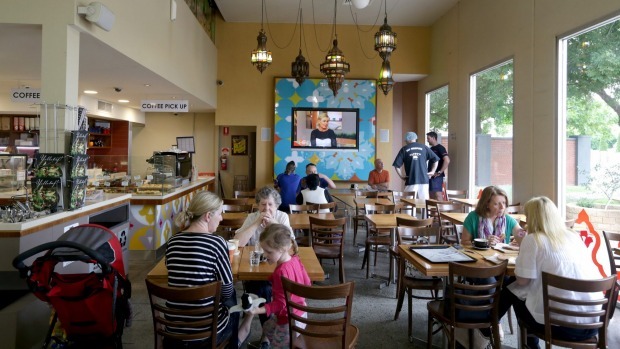 Now Oasis serves up to 3000 people on the weekends, turning out a mix of traditional Lebanese pastries and shawarmas and head chef's Marwa's modernised takes on Middle Eastern classics. While much of the menu is year-round, the breakfast menu is seasonal; this month the summer breakfast menu starts. Marwa, who designs the menu and oversees Oasis's five kitchens, is on a mission to encourage people to eat healthily, creating lighter incarnations of traditional Lebanese dishes as well as giving a Lebanese slant to popular healthy brekkies, like her new "superfood breakfast smash", made from dates, shaved apple, crushed almonds, shredded coconut and acia-coconut yoghurt and fruit ($13). "Lebanese food is quite healthy but I take out the fat. Lebanese use butter and ghee and so I tell people to get flavour from the spices instead of those things," she says. It is better, she says, to stock up on herbs and spices than to have lots of fat and butter in your pantry. "And when you eat this kind of healthy food it doesn't stay so long in your body. You process it straight away, and you can have bigger plate and it doesn't feel heavy on your stomach." And the plates at Oasis are definitely bigger. 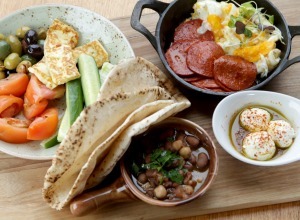 There's the ever-popular Lebanese breakfast – the summer version is fried eggs with soujouk, ful medammas, (a traditional breakfast dish made from chickpeas and lava beans), olives, grilled halloumi, tomatoes, cucumbers, labneh balls and pita ($19.90), which will see you through the whole day, if not the weekend; baked eggs with vegetables, mozzarella, zaatar crisp and sourdough toast ($14/$19 with Moroccan lamb mince); crispy beetroot salads with spicy fried chickpeas, green leaves, mustard vinaigrette, spicy labneh and two poached eggs on sourdough toast ($15), a sweet chill chicken omelette, with capsicum, tomato, mozzarella and house-made sweet chilli sauce on sourdough ($15); and the amazing (gluten free) baked ricotta hotcakes with house-made jam, maple syrup and Marwa's whipped beetroot mascarpone, halva and sesame snap ($13). You can also go for your standard eggs-as-you-like them ($9.50 for two) with less-than-standard sides, including soujok, baby spinach and halloumi. When she's not overseeing the kitchens or giving cooking demonstrations at Oasis, Mara is working on her second cookbook (her first, Yallateef! came out last year and can be bought at Oasis), in response to regular customers asking about her recipes. "Many people wanted a book to help them use all the spices, and it makes me so happy to share this, and to show people who to cook healthily," she says. "Cooking is my life!"